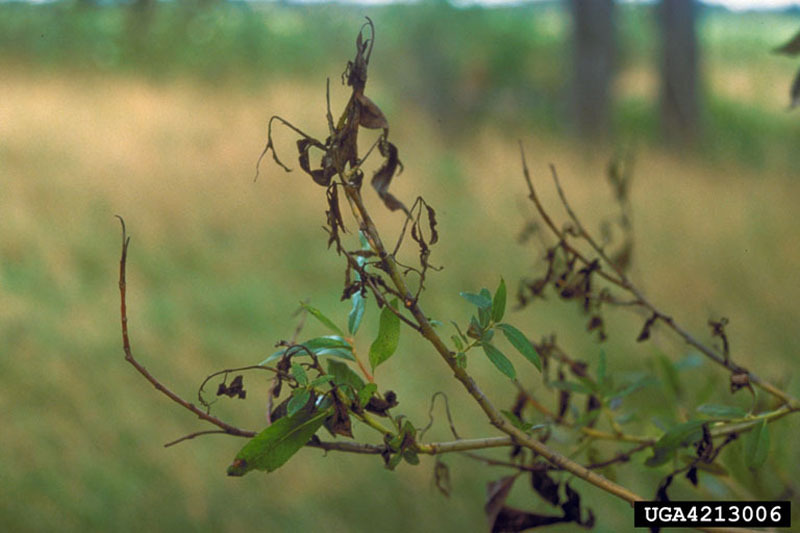 The scabs, recognizable by the browned or blackened foliage they cause in infected trees, are fungus diseases. In the case of willow scab, a fungus is the cause: Venturia saliciperda. Attacks by the Venturia saliciperda fungus are usually followed by attacks by the black canker Glomerella miyabeana (Fukushi) Arx. The fungus initially attacks freshly sprouted leaves, forming blackish or reddish brown blotches. The blotches spread quickly to leaf stocks, which fade, wither and fall off. Later, as the disease progresses, the fungus spreads to twigs and branches. Black cankers appear later in the form of slight, greyish or pale brown depressions. If the cankers completely girdle the branches, the branches die. In severe cases, where the infection is repeated over several years, the entire tree will dieback. The most serious damage occurs in the lower parts of trees.